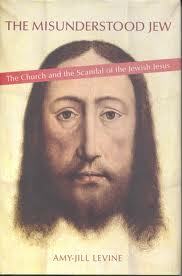 I have just finished reading a remarkable book by Amy-Jill Levine, The Misunderstood Jew: The Church and the Scandal of the Jewish Jesus. The book is remarkable because its author is a remarkable person. Dr. Levine is an Orthodox Jew who teaches New Testament at Vanderbilt University Divinity School in Nashville Tennessee. This alone would make her remarkable. But in addition, she is both bright and smart. The first term describes her intellect, the second, her social savvy. Although I can’t agree with everything I read in this book, I admire it all, and I admire Dr. Levine for having the moxie to tell both church and synagogue what no one else is telling them which they really need to hear. On top of everything else, her book, and Dr. Levine, is very well-informed. She has strong opinions, but she has not only done her homework, she has done most of ours. I scribble in my books, interacting with them aggressively. In this volume, some of my comments are summational others admiring, and some words of protest. You will not, should not, and need not agree with all you read here. But unless you have an axe to grind, you will come away admiring its author for all the qualities I have listed, and more. Like me, and a lot of other East Coast Jews (she’s from North Dartmouth, Massachussets, while I am from Brooklyn, New York), Dr. Levine grew up in a neighborhood where the Protestant Reformation had not yet occurred. Where she and I grew up, you were either Jewish or you were Catholic, and in both our cases, “they” outnumbered “us.” She presents a charming account of her childhood fascination with Christianity, and her parents cautious but liberal approach to leading her interact with Christian friends. She didn’t encounter anti-Semitism until her high school years, which was also the first time she got to read anything in the New Testament. However, because her experience with Christian friends had been so positive, she was not repelled by what she discovered, but was curious as to how the good conduct of her Christian friends and the bad connotations of what she read and encountered related to each other. She is still living in that place, as a broker of peace between two traditions, amidst the behaviors of people and institutions that either honor those traditions or disgrace them. Unless we Jews understand the briefs and practices and histories of our Christian neighbors and unless Christians understand Jews and Judaism—we’ll never achieve the shalom (“peace”) that the children of Abraham (including Muslims) all claim to be seeking. Plus I write not only as an academic who teaches New Testament in a predominantly Protestant Divinity school but also as a Jew—and a member of an Orthodox synagogue—who recognizes the beauty of the Christian tradition, the harm that has been perpetrated in its name, and the several means by which it’s basic, important messages of justice and peace can be heard a new. Further, I’m convinced that interfaith conversation is essential if we are to break down the prejudices that have kept synagogue and church in enmity, or at the best tolerance, for the past two millennia. In other words, I am placing my scholarship and service to personal, pastoral, and even political ends. That, of course, makes me biased. But being biased is not the same thing as being wrong. The point of interfaith conversation is not to convert the person across the table, but it is also not abdicate one’s own theology for the sake of reaching agreement. . . . Put another way: there is no reason for Jews and Christians to sacrifice their particular beliefs on the altar of interfaith sensitivity. Like us at Interfaithfulness, Amy-Jill Levine sees Jesus as a bridge, although she does not agree with us that he is the Messiah. I especially appreciate her emphasis the disagreement is okay, and that distinctions should be preserved. Who wants to live in a world where the Christians swallow up the Jews, or the Jews swallow the Christians? Certainly not me, and probably not you either. Historical investigation enabling people to see Jesus in his original Jewish context. Developing the ability to see Jesus and his edginess, not as some pallid harmless nice Rabbi in Galilee. A restored capacity to see Jesus within Judaism. The recognition that a distorted view of the Jews results in a distorted view of Jesus. The redressing of Jewish ignorance of Christianity, and Christian ignorance of Judaism. Correcting the tragic fact that Jews know the bad news about Christianity but know nothing good about it. The need for true dialogue where neither party sees itself as victim, or the other as perpetrator. You can see from all of this that she has set quite an ambitious agenda for herself. While tomorrow is a Torah Tuesday, and we will be hearing from Moses Our Mentor, on Wednesday I will begin summarizing and interacting with each of her chapters one by one. The first chapter is “Jesus and Judaism.” Please join me!